The DroidDoes.com micro-site for all things DROID has been updated as of late last night with a Bionic page that asks for 4 codes to be entered from 4 different tech blogs. There is also a countdown that points to tomorrow at 12PM. We are not sure if that means the phone will be announced or if a new @DroidLanding scavenger hunt will begin. Yep, that Twitter account has also gone live as of just a few minutes ago. And no, we were not included in this one, but it’s all good. 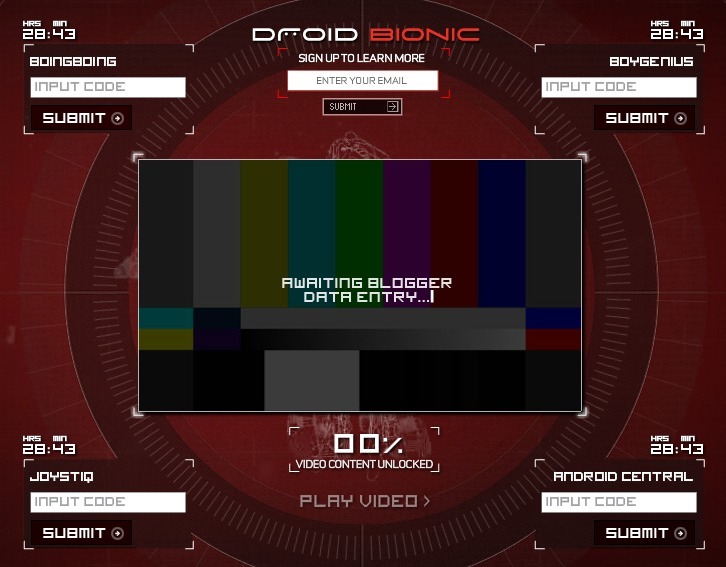 Someone was kind enough to send us that Bionic teaser video, remember? Update: We’ve posted the scavenger hunt details here. Cheers Jeff, Nick and everyone who sent this in!